Interitus Dei (1994-present) is a Gothic band from Constanta, Romania. rom the very beginning, the style (doom gothic) played by the band was very well received. Interitus Dei was considered, both by the audience and by the critics, as one of the best Romanian rock bands of that time. Although they officially started in 1994 as simply Interitus it was in 1997 that the first LP Lonely White Idols, produced by 'Bestial Records', was released using the Interitus Dei name, having the line-up of Bogdan Boeru (bass/vocals), Ana Mladinovici (vocals), Cristi Tentu (guitar), Max Chelaru (guitar), Adi Stavian (keyboards), and Ionut Micu (drums). The LP featured the singles My own Hell and The Human God, both of which soon became popular among the local gothic aficionados. In 2000 'Bestial Records' produced Interitus Dei's second LP, The End of Revelation. The LP was first presented at the Bolkow Castle Party in Poland. At that time the band was comprised of: Bogdan Boeru (bass/vocals), Ana Mladinovici (vocals), Bogdan Costea (guitar), and Adrian Mihai (drums). The new line-up brought about a new style consisting of a mixture of heavy, power and symphonic highlights played against the old gothic background. Shortly thereafter, video clips were made for two singles from The End of Revelation for the tracks Eclectic Heart and The Previous End. In the meantime, the band organized the first three editions of the Metal Heart Fest, one of the first big serious rock festivals in Romania that occurred on November 2001, March 2002, and August 2002. 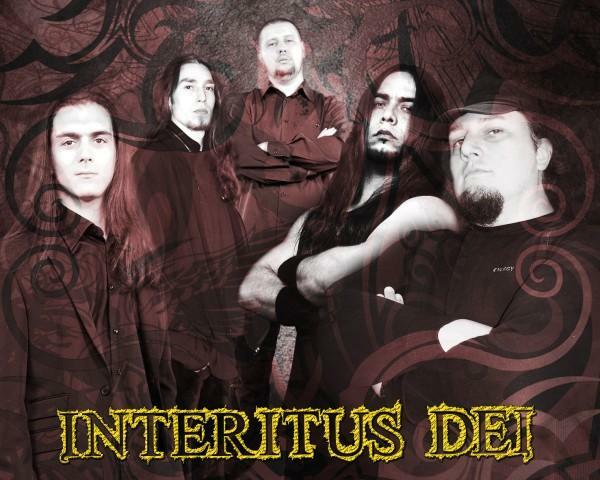 In 2002 'Sidekick Records' (Norway) produced the third Interitus Dei LP, Unholy with the line-up Bogdan Boeru (bass/vocals), Ana Mladinovici (vocals), Bogdan Costea (guitar), Ruhan Terente (guitar), Traian Boala (viola), and Cristi Barla (drums). The LP continued to explore and innovate on the style first tackled in The End of Revelation thus creating what was to become their own original style dubbed 'Eclectic Met al'. In 2003 the line-up was dramatically changed with the members Bogdan Boeru (bass/vocals), Adrian Galu (vocals), Cristi Tentu (guitar), Ruhan Terente (guitar), and Marian Mihaila (drums). Meanwhile, the band had a performance at Steel Meets Steel Festival in Dortmund, where the boys played live with Tankard, The Forsaken, Scanner, Pounding Dead Heart and Oneiros. In 2005 the band was invited as an opening act, to support the Paradise Lost show in Bucharest. The third Interitus Dei video The Memories Of The Snake then arrived. In Motion... (2009) and Occult (2012) followed under the membership Bogdan Boeru (bass, vocals), Cristian ?en?u (guitars), Ruhan Terente (guitars), Adrian Galu (vocals) and Sebastian "Natas" Macovei (drums). The compilation, Works (1995-2000) arrived in 2015.